The Gutenberg Elegies is a necessary piece of writing in a much larger body of work regarding literature and the progression of digital reading technologies. Having been republished twelve years after its initial publication, with the inclusion of a new introduction and afterward, helps put the writing between two contextual bookends that, in some ways, simultaneously justify and excuse Birkerts’ original intent. This is one of Birkerts’ most well-known books, though he has written several others all revolving around the issue of writing and literature, including Reading Life: Books for the Ages and Then, Again: The Art of Literary Memoir. Birkerts’ reason for compiling these fourteen essays is his call-to-arms in an attempt to fortify the edifice of literary intelligence against the swiftly approaching army of screens and microchips. He divides this battle into three parts: the first containing six autobiographical chapters, the second made up of four technology focused musings (including audio books and interactive CD-ROMs), and lastly, an appropriately named ‘Critical Mass’ section, in which he investigates and expands upon the writings of other scholars in the field. From the first several chapters, Birkerts writes about his own life and musings about the subject of literature and the act of reading. In his writing, Birkerts does not cite very many other works, indicating that many of these thoughts are his own. He frequently references Marshall McLuhan, but all together he cites about a dozen books and articles combined. Initially, Birkerts seems quite resistant to technology, often making claims that our intellectual capacity will diminish without the constant exercise of literary discourse. He mentions one particular class of students he tasked with reading “Brooksmith” by Henry James. When asked how they liked the book, many students bemoaned the labor intensive read, citing they “just didn’t get it.” At this, Birkerts began to examine the reasons why students of this generation would have such a difficult time and noticed that this was marking a significant shift in the way we read. Throughout many of his essays, Birkerts grapples with what he frequently calls the paradigm shift. He takes note of the important advancements the digital age is bringing to the world of reading and writing, but much like hugging an over-zealous member of your extended family, Birkerts struggles with fully embracing the notion. In some ways, it seems he is trying to appease readers on both sides of the argument, pro and con. He approaches technology with apprehension, often times turning his back all together, firmly planting his feet and crossing his arms while keeping a wary eye on how his surrounding world is hurtling towards the new digital age. Several of the essays are quite nostalgic; Birkerts recounts the impact that reading, writing, and books had on his life and intellectual development. In many of his essays, Birkerts justifies Marshal McLuhan’s popular phrasing “the medium is the message,” yet in other essays he seems to forget that the notion was ever mentioned. He claims that it is the book itself that makes him feel this way, however he cites nothing about the physical object; never does Birkerts mention the smell of the pulp, the texture of the page or the weight of the book or binding, therefore his argument, by default, rests on the act of reading itself. Yet the act of reading in the digital age has not changed. In his afterward, Birkerts says, “The real message, as Marshall McLuhan proposed a good half century ago, is the medium. The playing, not the play, is the thing. I hewed to the same basic premise in writing the original essays in this book, and it holds for me now, but in a new, more specific way” (244). In this way, we see that Birkerts is struggling with the subject. On one hand, we notice his reluctance, but on the other, we see the benefits of the advancements in the digital age. This interplay creates what I find to be a very interesting tension, in many ways mimicking the feelings of many readers today. Therefore, I do not find him a hypocritical author, but rather, a realistic and dynamic one instead. From the introduction to the 1994 edition of the book, Birkerts tells us that each of the fourteen essays in this book were written independently of one another (and therefore asking a pardon for any time he repeats himself, saying that the subject “cannot be sufficiently remarked”) yet all share a common theme. Every so often, referencing to the introduction helps remind us of Birkerts’ true intentions. Since these essays were written separately, Birkerts admits that they were not necessarily to be read in a linear fashion, but rather in groups sharing a common space (hence the different and distinct parts of the book). He also admits that some of the essays were a bit pessimistic, but ultimately, these were composed on his own mind “—that of the dreamy fellow with an open book in his lap” (7). Birkerts has written this book for fellow writers, readers, and those concerned on the impact of digital media. Soon after the 2006 edition of this book, Jeff Gomez published his take on the subject titled Print is Dead: Books in our Digital Age mere days before the release of Amazon’s eReader, the Kindle in November 2007. Like Birkerts, Gomez highlights how important readership is in this transient period. Some aspects that Gomez highlights fill in the holes that Birkerts had not mentioned, including how similar the world of publishing and digital reading is to the music industry. He points out how Amazon has legitimized the digital copies of books with their eReader, the Kindle, just like Apple legitimized the downloading of digital music with their mp3 player, the iPod. 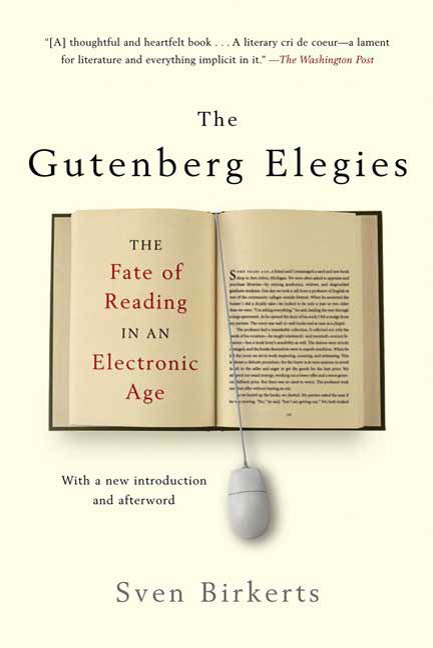 In 1996, two years after the first publication of The Gutenberg Elegies, Geoffrey Nunberg composed The Future of the Book, a similar compilation of essays, regarding the shift in technology. Various authors covering multiple facets of the subject, including historical, philosophical and linguistic perspectives, wrote the essays. These writings consider that the computer will take neither complete nor immediate control over the publishing industry. Instead the different viewpoints maintain a steady balance of opinion. The Gutenberg Elegies provides an interesting perspective on the transition from a printed literary culture to digital one. Though there are some topics that are absent from the text (such as the book as object, any in-depth historical facts, or current statistics), it supplies some insight into the perspectives of many minds in the literary community. Though written in the early – mid 90s, Birkerts still sounds remarkably current. It seems he makes a point not to draw attention to specific technologies (aside from infrequent references to Nintendo and Sega) and in doing so, sounds very natural and relevant to the advancements since the second publication twelve years later. Reading either of the other two books mentioned in this review (Print is Dead, or, The Future of the Book) may offer a wider breath of knowledge in the subject, while the intention of Birkerts’ volume offers depth.